Christmas Countdown-Kit Kat Trees are candy bars shaped like a Christmas tree decked out with decorative star and sprinkles. Then if you want to create another no bake treat for the kids, make Hostess Sno-Ball® Snow Men Faces. So easy, you won’t believe it! Your kids will love making these last minute cakes & candies, make extra they won’t last long. Let’s get started on our Christmas Cookie Countdown, a jump start on our cookie candy trays for the Holidays! Make sure candy is in one solid piece and not broken apart you will be cutting through all horizontal 4 layers. Use a serrated knife for cutting clean lines, cut into tree shapes, save leftover pieces of Kit Katt for tree stumps. Place green candy melts into a zip lock baggie, sealed tightly, place in bowl of very warm water. Massage melts until smooth, push melted candy to one corner and clip edge of baggies with scissors. This is your piping bag. Attach tree stump with melted candy. Allow to dry. With piping bag drizzle horizontally the top of the candy tree like a garland with the green melts. Add sprinkles while candy melt garland is wet. Allow to set before moving. These trees can be made ahead and refrigerated until serving. Assemble all ingredients and cut shapes before creating with the kids. (Knife safety in mind here). *When you purchase the Kit Kat make sure it is solid and not broken apart. You will be cutting the kit katt with the lines or sticks laying horizontally providing a wider tree looking shape. If you break the pieces, no worries, just candy melt them together. 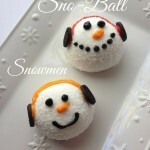 Christmas Cookie Countdown-Sno-Ball Snowman Faces are so cute and perfect for a cookie-candy tray! If you don’t like to bake this is for you! Hostess Sno-Balls ® are the face of this snowman, pipe a colorful frosting headband with mini Oreo cookies, a nose, eyes, smile and you are done! Finished!!! The Sno-balls are marshmallow rounds with a surprise cake filled center and covered with coconut. No baking just quick decorating for a cute holiday cookie tray. Unwrap Sno Balls and place on flat surface to decorate. Divide frosting into thirds in three separate bowls, tint with individual food coloring gel. Stir to combine. Place each frosting color in a disposable piping bag fitted with a small tip #5 or a zip lock baggie with one corner clipped to pipe. Pipe the face details; black for eyes and mouth, orange for the nose. Pipe a line around the top of the head for a head band, then add the mini Oreo® cookie halves. Pipe a dollop of frosting on one side of the head to attach the cookie, repeat with the other side. Serve these treats on a white decorative platter sprinkled with flaked coconut or edible decorative snowflake jimmies. * if you don’t want to make your own frosting, ask the bakery at your local grocery store to sell you a 1/2 cup each of the colorful frosting you want to decorate with. To liven up your Christmas Cookie Tray consider adding a few quick candies like the Kit Kat Trees. Your kids will love making these. 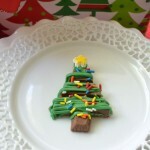 All you will need to do is cut a kit kat bar into triangles, tree shapes, add a tree stump, drizzle with green candy melts and Christmas sprinkles or jimmies. That’s it!